The New How You Can Play Better Golf Using Self-Hypnosis is an additional product that Andy Brown offers in his webiste on top of the New 4 Magic Moves to Winning Golf. It comes in a hard copy format, as well as in ebook and audio (CDs) formats. Throughout its 51 pages, the author (Jack G Heise) emphazises the role that your mind plays in playing golf the best way you can. This is not a new concept, of course. There are many other books and learning aids that deal with the notion of "the inner game" and how to program your mind to achieve better results when playing golf. This book, however, takes you step by step through the concept of self hypnosis, explains why technique alone is not sufficient for a consistently good golf swing, and reveals how to achieve self-hypnosis using mental pictures. "The difference between the good player and the poor player is his mental approach to both the swing and the game. The good player knows not only what to think, but how to utilize his thought to make his play effective. The poor player, unable to visualize such terms as concentration, blank mind, relaxation and tension, struggles hopelessly in a mental fog. He is like the poerson who owns a computer or TV. He knows there are certain mechanical parts that are operated by electricity. However, without complete instructions he could not put one together and make it operate, even if he had all the parts. The insturction for assembling the mechanical parts of the swing is the mental side of golf. The power to operate it is hypnosis." This book gives you the instructions on how to create "the software" (if you will) on how to operate the mechanical, physical sequence of movements that constitute the golf swing... consistently, effortlessly, and precisely. The first 4 chapters explain the relationship between your subconscious and your game, what hypnosis is, and how it can help your game. Chapter 5 gives you specific instructions on how to achieve self hypnosis, and gives you an example of the sort of suggestions you need to repeat to yourself to induce your mind into a hypnotic state. Chapter 6 teaches you how to use mental images to program your mind whilst you are in a self induced hypnotic state. The chapter also explains why this works, and what results you can expect if you are diligent in your programming. 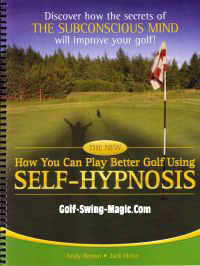 I like the fact that the author does not claim that hypnosis alone will make you a better golfer. On the contrary, he emphazises that "practice is the recording session for your subconscious mind. During practice your conscious mindmus evaluate the correct muscles to be used and theamount of energy to produce the desired distance." Chapter 7 breaks down what the professionals do during their swing, so that you can incorporate the images you see into your mental programming sessions. Chpater 8 explains the concept of "time distortion" i.e. the notion that time sense can be altered at will by hypnotic suggestion, and how using this principle, you can cram long golf practices into just a few minutes of mental programming. This is a fascinating chapter, as it reveals that you don't need to sit in a lotus flower position like a yogi guru for ages when you program your mind to play better golf. It takes just a few minutes if you know how. Chapter 9 discusses how to deal with fear and hesitation by creating confidence in your game. It is a short chapter, but it is worth reading and applying its principles. Chapter 10 teaches you how to deal with errors. Golf errors can build great barriers if you're not careful. Not knowing how to handle errors in the golf course is the equivalent of inserting bad programing code (bugs) into your golf program. This chapter teaches you how to prevent inserting savotaging commands into your golf programming. Finally, Chapter 11 is a summary of the whole book, and it provides you with a series of answers to questions the author frequently receives about hypnosis and golf. 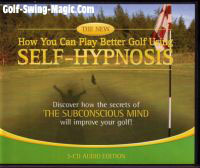 The New How You Can Play Better Golf Using Self Hypnosis is a good complement to Joe Dante's New Four Magic Moves to Winning Golf. The latter gives you the mechanical instructions and analysis on how to develop a consistent and effective golf swing. The former tells you how to program your mind so that your body automatically incorporates the instructions at a subconscious level, eventually making your swing fully automatic. You could ignore the mental component of golf at your own risk. Professional players do this stuff consistently to keep up their golf performance. Unless you believe you're better than the Pros, you would be better off working on your mental game at the same time as practicing your techniques. As I mentioned before, the book also comes in audio CDs and, depending on your learning style (whether you prefer reading to listening, or whether you like doing both), I believe getting the CDs version would be the best option. This is because you can then rip the audio files into MP3, and extract the hypnotic suggestions from chapter 5 to induce yourself into a hypnotic state. Or you could simply select chapter 5, and listen to that part of the CD when you're ready to start your hypnotic session. Is this the only book you should/can get on the subject? Absolutely not. There are many other books out there that deal with the inner game, but this one seems to complement Joe Dante's New Four Magic Moves book. If you can afford buying both books, do it. As I said before, both complement each other. They are like the 2 sides of a coin. My final recommendation is this: You should get Joe Dante's book (hard copy) and the DVD, as well as the Self Hypnosis book on CD. You'll be able to derive the most benefit by this combination. Alternatively, substitute the hard copy of Joe Dante's book for the CD version, but still buy the DVD, as the DVD clearly illustrates the 4 magic moves in motion.